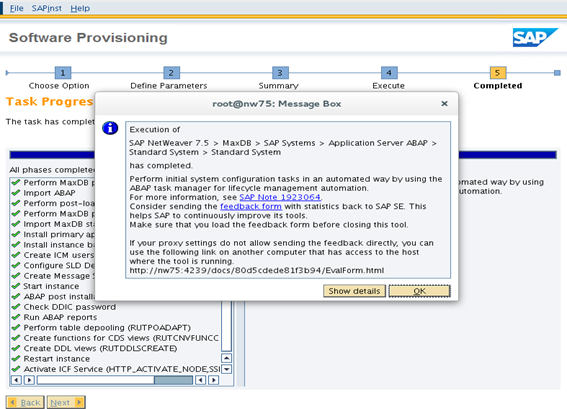 Install an SAP NetWeaver ABAP 7.5 system on SEL12 | It`s full of stars! Download and install SUSE Enterprise Linux 12 from Suse and install it. The OS is available as 2 DVD ISOs, 7.6 GB of data. If I remember correctly, I only needed DVD1 in the end. The wizard will ask you to provide the sizing of the system. Of course, on a laptop, demo is enough. A virtual IP and hostname can be configured, if you wish. Not necessary, recommended, but I opted to not use this. With the gathered information, Yast2 is going to install additional software. To add the medium, confirm that you want to had another one each time. After adding all needed data medium, select no and also inform the wizard that you do not have an additional medium: No. SUSE documentation told me that now sapinst is called and started. Did not work for me, so I had to start it manually (which, btw, means, that all the above steps were a waste of time as I had to add each medium again in sapinst). Nevertheless, in case you have more luck than me, sapinst should start and ask you some more questions like system name, SID, schema name, and so on. And then starts installation. Takes a while. 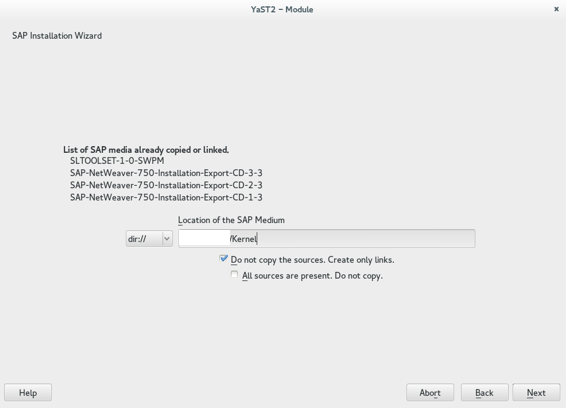 Import ABAP steps takes some time. In case anything is configured 100% and the system has all the libraries and the user premissions needed for an SAP system, the installation will just run through. 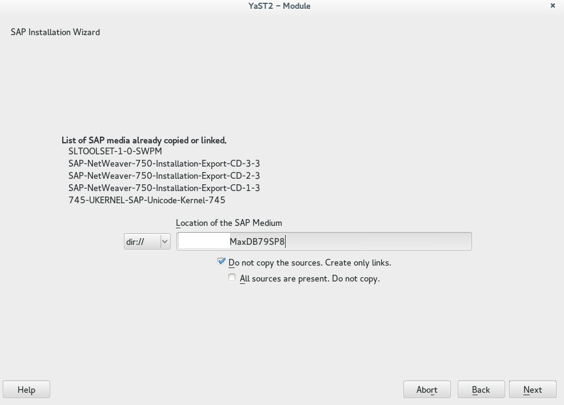 When you reach the last step of the installer, you can see that the NW ABAP system is being started and the final configuration is executed by calling some BAPIs. After the installation is finished, you see the confirmation dialog. 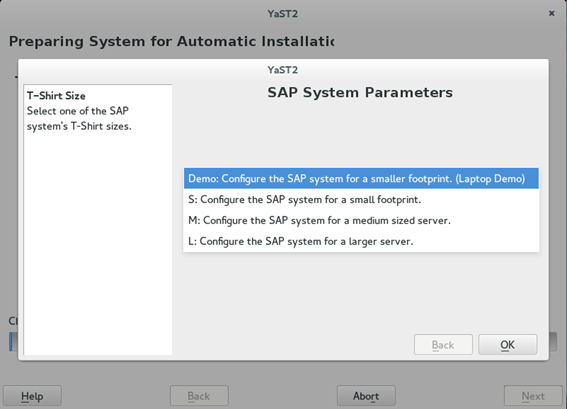 The dialog contains a SAP Note pointing to a note explaining how to speed up initial configuration of your new system. Read the note, or read my blog on this. Now you can log on to the system. In the system status, you can check the system information. Congratulations, it is a SAP NetWeaver ABAP 7.5 SP00 system! This entry was posted in Basis, SAP and tagged 7.5, abap, installation, netweaver. Bookmark the permalink. Great post. Could you please share the current download link? The last one from SCN (http://scn.sap.com/docs/DOC-67351) it’s not working. I am not using a trial version. 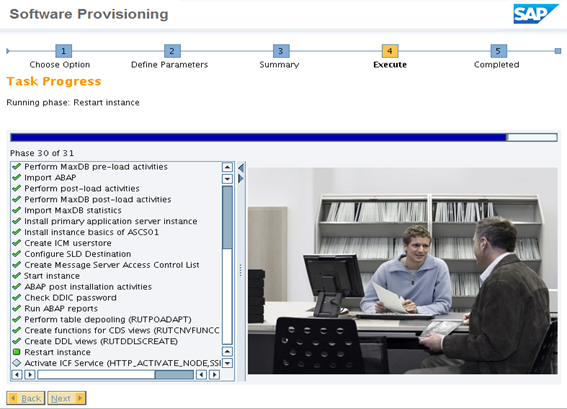 You`ll have to download the installation files from SAP Service Marketplace. You`ll need an S-User with download permission and a license file later on to be able to use the system. For this laptop version, what is the disc size you need? it`s a VM. I`ve put 500 GB for disk size, that dynamically grows. Currently it occupies 90GB on my physical disk, but there is room to shrink. Using the VM, installing add-ons, etc, you can plan with 120 GB. For RAM, I reserved 3GB. Depends on what you do, I have a NW ABAP system with 2GB, and it works. One landscape setup I have is 3 VMs: 1 SMP3, 1 GW, 1 ABAP backend. All with 2 GB of ram (max 6). Not super fast, but works fast enough. When i check the Service Market place for SAP NETWEAVER 7.5, it says under precondition “In order to install SAP NetWeaver 7.5, a SAP Solution Manager system is required. 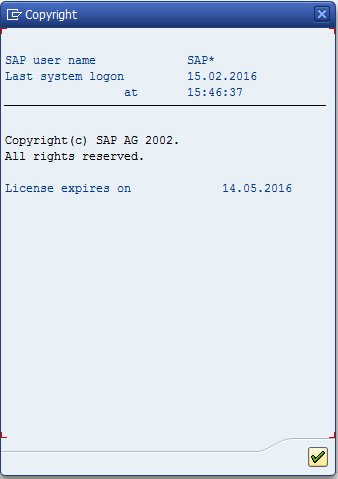 During the installation, the system requests a SAP Solution Manager Key.” So solution manager system is not required? 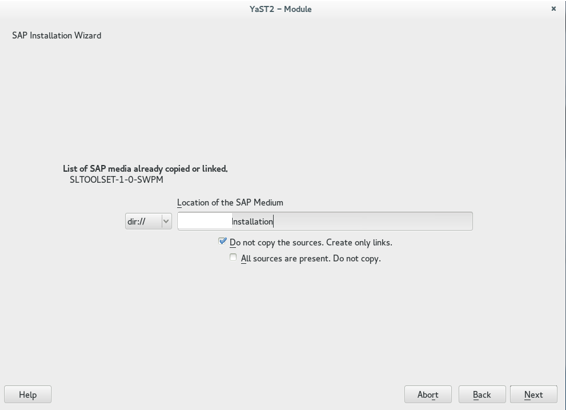 You can install NetWeaver 7.5 without the SolMan key. You won`t be able to update the system later on, but for testing and playing around a base system is enough. Thanks Tobias. I was finally able to get this done on Windows with Sybase. This is my first try at installing a system (I am no BASIS guy), so have a couple of questions. 1. The current support pack for NW750 is 3. The install came with SP 0. Is it not possible to directly get to the latest support pack while doing a fresh install (using SWPM)? 2. Is SUM / Solution Manager the only way to get to the latest support packs. Can’t we use SPAM? Update: Upgraded to latest SP for BASIS components. Need to try for ABA now. could u please tell me to set a static address for eth0 in sles 12, how to change /etc/hosts file before installation…. 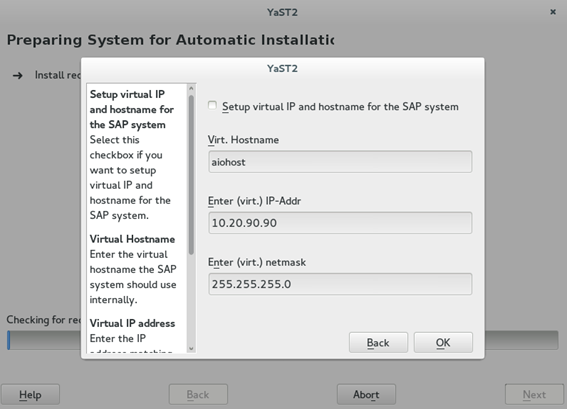 You can use Yast2 to define the IP address. Thank you for sharing your experience with SAP NetWeaver for MaxDb. 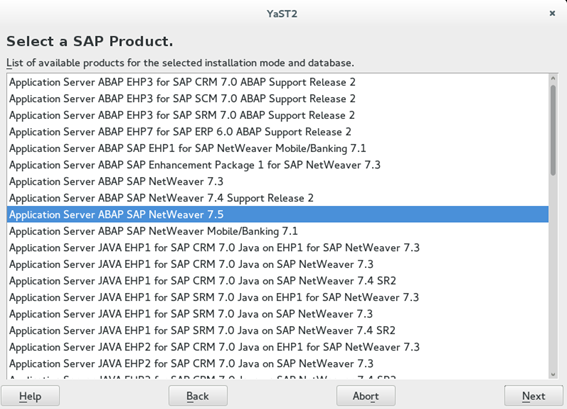 I would like to known which archives should be download to install SAP NetWeaver ABAP AS 7.52 for SAP HANA. I have searched for those archives many times on Support SAP, but there is nothing clear.